A large number of samples of the movement production heyday, the 20th century, is displayed here. Currenty, 835 movements from 145 manufacturers wait for your discovery, and their number steadily increases. Have fun! 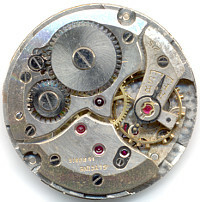 This beautiful swiss windup movement was made in the 1940ies. 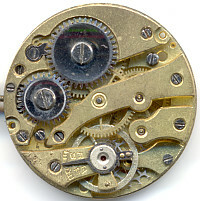 A common form movement for ladies' watches from the 1940ies. 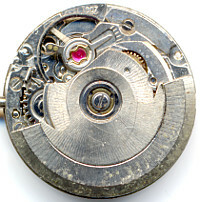 This 10 1/2 ligne windup movement with cylinder escapement promises more, than it can hold. 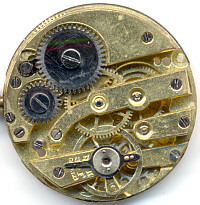 In the past, especially between 1930 and 1970 more than 10.000 different movements were made, some in a million copies. 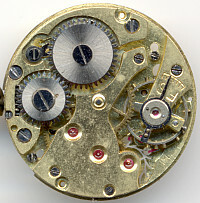 The advent of the quartz watch in the 1970 terminated that impressive series, and the greatest part of those movements has not existed for a long time. 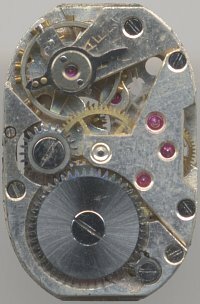 The movement archive on 17jewels.info should counteract further oblivion and show how diverse mechanical movements once were. Of course it can never hole the complete stock of all movement ever made, yet almost every week, new movements are archived and shown more or less detailed. Currently, more than 835 different movements found their way into the archive and are at at least virtually accessible to posterity. You can directly access the movement by the “movements” menu. Besides the movements there are other pages, which complement the topic “mechanical watches”, such as a collection of Timex watches, some loose articles in the magazine, a few documents and some workbench related articles. The archive lives from permanently acquiring yet unarchived movements, to catalogue and put them online. Who wants to support it with a small dontion, can get a “supporters” page as thanks. Have fun exploring the world of mechanical movements!